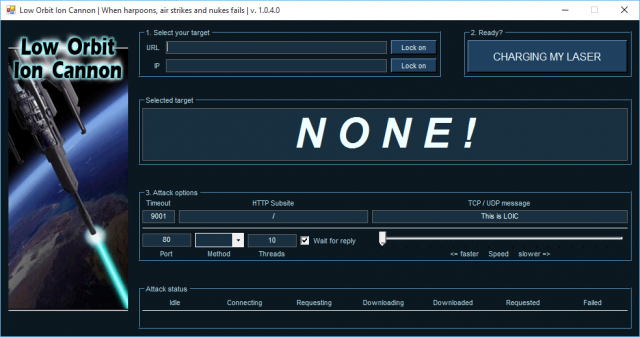 LOIC Download below – Low Orbit Ion Cannon is an Open Source Stress Testing and Denial of Service (DoS or DDoS) attack application written in C#. It’s an interesting tool in that it’s often used in what are usually classified as political cyber-terrorist attacks against large capitalistic organisations. The hivemind version gives average non-technical users a way to give their bandwidth as a way of supporting a cause they agree with. The Low Orbin Ion Cannon performs a fairly basic TCP, UDP or HTTP DoS attack and when used by multiple individuals as it normally is, a DDoS attack. The popularity came about as it has a version by Anonymous with an IRC based control channel that allows people to join voluntary botnets and attack single targets (often led by 4chan or Anonymous themselves). Note: It does NOT allow remote administration of your machine, or anything like that; it is literally just control of loic itself. Is LOIC a virus? No, it’s not – although many anti-virus software will detect as a virus (something like trojan.agent/gen-msil flooder) as it’s usually used for malicious purposes and many users have it installed without their knowledge. It’s a very simple tool really, you just need to fill in the URL or IP address of the target system, select the attack method and port and press the big button that says “IMMA CHARGIN MAH LAZER”. Step 1: Run the tool. Step 2: Enter the URL or IP of the website in the relevant field and click on “Lock On”. Step 3: Change parameters if you’re l33t, or just leave it as default for the rest of you. Step 4: Now click on the Big Button labelled “IMMA CHARGIN MAH LAZER”. You have just mounted an attack on the target, well done – I guess. You can see the status of the attack in the tool (number of packets sent etc). 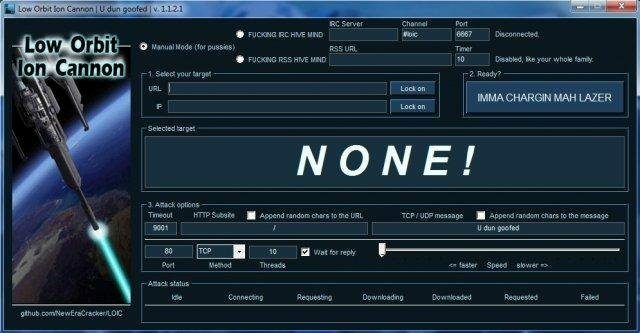 It goes without saying use this tool carefully, it’s illegal in most countries to carry out DoS or DDoS attacks, using this tool is no exception. Use it to test networks you have permission to access or stress test and to demonstrate the power of DoS attacks. To get the full leverage you need a large network of users all attacking the same target at the same time which can become a very effective DDoS attack (as seen by the Anonymous attacks on PayPal, Mastercard etc).